The Superfood Blue glove is made from FDA-compliant materials and is a lightweight, form fitting glove that offers excellent fingertip sensitivity and dexterity. 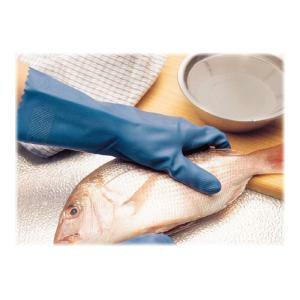 With a 'fishscale' type grip pattern, Superfood Blue gloves offer good grip on food products. Case hardened for better resistance against fats and oils. Sanitized to help reduce bacterial build-up on the glove. Made from FDA-compliant materials, offers good grip. Case hardened for better resistance against fats and oils, sanitised to help reduce bacterial build-up on the glove.